Commercial barge built in France in 1960 in the famous yard of Forges de Strasbourg. Freycinet barge converted into a youth hotel up to 51 and 3 crew members. Boatman's cabin is still fully equipped and independent from the rest of the boat with air conditioning, saloon, private galley, a double bed cabin, and ensuite shower and heads. A single bed crew cabin totally independent is lodged in the foredeck with heads and sink. Upper deck includes a professional galley, equipped with all gas cooker, deep fry, and storages. Followed by a huge space used as the dining area, followed by the communal heads (3) and sinks area and showers (3). Access to the tiled forward deck, secured. Lower deck is the accommodation level and the technical room. Long corridor leading to the 15 cabins plus a utility room for washing machine and dryer. air ventilation through out all the cabins. 2 Black & grey water treatment plants are also installed at this level. Individual electric heating in each cabin. hot water produced by electric heater. Main electricity by shore power or produced by 2 Perkins generators (50KwA). Ultra violet fresh water treatment. Wheelhouse is hydraulicaly raised, air draft up to 5.40m or down to 3.40m. A camera is fitted to help during the navigation. Manual windlass but equipped with an electric motor to help and lift the 2 ancres, 50m chain each. hydraulic system and 2 joy sticks to manoeuvre the boat, no wheel. Freycinet barge for sale in France. 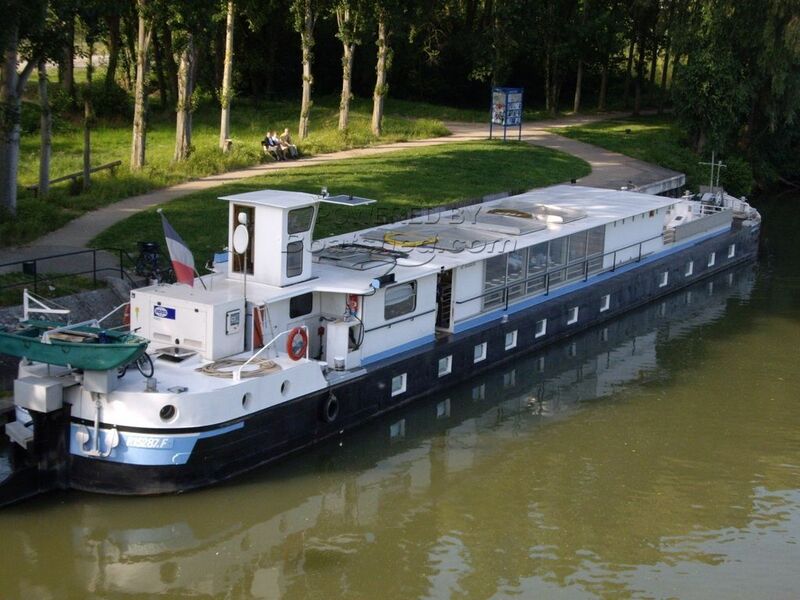 Boatshed Paris is happy to offer this unusual live aboard barge for sale in the Paris area. Previously used as a youth hostel accommodation barge for up to 52 passengers. The passenger certificate has lapsed but the vessel is sold with a virtually new Certificat Communautaire (TRIWV). May be certified as a static (none cruising) reception vessel to organise seminars, dinners or a restaurant boat or private residential barge. For more information or organise a visit, please contact Pascal, your local broker at Boatshed Paris. This Peniche Freycinet Used As School Holiday Vessel has been personally photographed and viewed by Pascal GAETAN of Boatshed Paris. Click here for contact details.